After being dropped off by taxi, and since I had carry-on baggage only, I walked to check-in which was in the premium area at one end of the terminal and then took the elevator up to have my passport checked and go through security. From there it was only a short walk to the lounge. Business class passengers have access to the Admiral’s Club Lounge in Terminal 4, which is close to Gate 40. If you are a gold card with BA, then you are Emerald in the Oneworld Alliance and so gain access to the Flagship Lounge. Access to these Flagship lounges is subject to many rules, and indeed I had been told at check-in that, despite being Emerald, I was not eligible to get into the Flagship Lounge because I was flying on a three-class flight (i.e. with First). I don’t know if that is true but to see the full criteria, click here. As I was so early for my flight, and very hungry, and despite the fact that I had been told I could not get in, I asked again at the Admiral’s Club reception and was given a key card. I then took the elevator up one level. A second Admiral’s Club Lounge reception desk is here, with the Lounge being on both the left and right — you can go either way because it loops round the elevator shaft behind you and takes up the whole of this upper level. I turned right and then left as I got to some windows looking down to the concourse level, and used the key card to open some sliding opaque glass doors. Inside was another reception desk. Feeling a little like Alice in Wonderland, I handed over my key and gained admittance to the Flagship Lounge. I have to say the offering did not seem to change for the four hours I was there from 1400 until 1800 and it was more Light Lunch than Flagship Supper, but I found plenty to eat among the salads, hot main course and drinks. On a couple of occasions I walked out into the large Admiral’s Lounge. This also has lots of natural light being above the concourse level and looking down onto the gates. Although most flights aren’t called from the lounge, London and Brisbane are. I didn’t wait for that, though, and walked down to the gate (41) which was only a short walk away at 1800 where boarding had already commenced. I used the Priority Queue and went straight onboard. Once onboard a flight attendant said hello and waved me to the left since I was in the front cabin of the two business class cabins. This was my third flight in premium cabins with AA in three days, and this obviously is the way they’ve been told to greet passengers. Not only do they not check your boarding pass, they assume you know where you’re going and don’t need a smile to get there. I stowed my belongings, took off my coat, and draped it over the back of my seat. Drinks were offered (Champagne or orange juice). I asked if I could have some water because I had a headache and wanted to take some pills. The flight attendant said that they had already given out bottles of water. I said if they had then I must have missed out, not having been onboard until a few minutes earlier, so she said she would come back with some water and also to hang my jacket. In fact, one of her colleagues offered to hang the coat a few minutes later. She did return after about ten minutes and gave all of us a bottle of water each. I had flown over to New York a few days previously on an American Airlines B777-300ER and so this flight review builds on the observations made there, rather than repeating everything. 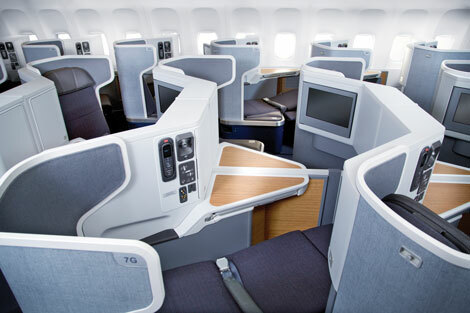 The B777-300ER aircraft has eight first class seats, 52 business class seats in two cabins, 30 Main Cabin Extra Seats and 220 Main cabin (economy) seats. 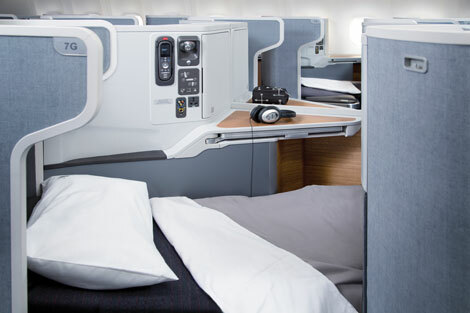 The business class cabin of 52 seats is in two cabins, one small cabin of only two rows, and then the main business class cabin which runs from 5-15. To see a seat plan of the aircraft, click here. I was in the front cabin in 4A for this flight, having flown in the main cabin 9A on the previous one. There are overhead lockers above all the seats, and the seat has a small amount of stowage, with a space under the tray table for some items, and a magazine pocket. The angle of the seat also means you can place items (books, magazine) on the seat next to you under the arm of the seat. The table is firm — much better than the one in Club World on British Airways, for instance, and I used the inseat power to keep my laptop going. AA business class is very similar to many of the business class seats which are flying today (Cathay Pacific and Delta, for instance). It is in a 1-2-1 configuration, with the seats by the window (A and J) facing the windows, and the two middle seats angled towards one another. It offers a large amount of privacy in this configuration. These are excellent seats, good for sitting relaxing, and also when turned into a fully flat bed. To watch a video, click here. The IFE screen swings out from the side of the seat in front and has to be stowed for take-off and landing. The IFE had some new films just in the two days since I had last flown on the B777-300ER, although whether this was because we were getting towards the end of the month, or just that different films are loaded on different routes, I don’t know. Disappointingly, and for the third flight running in as many days, the IFE wasn’t working properly. The audio choices include radio channels and these didn’t work, and none of the new films had actually been loaded onto the aircraft, which resulted in many complaints from all cabins since Gravity, All is Lost and Captain Phillips, to name just three, were being promised but then refused to play. One of the cabin attendants told me they had “written this up” and apologised, and said she couldn’t understand how Emirates could load 500 plus films on but American couldn’t get it right. In this front cabin, avoid 4A and 4J because of galley noise, which to start with was very impressive, with sharp loud bags as various items were stowed before take-off and later at various service times. Row 3 is quieter, but it only has one window compared with the two that row 4 has. All the seats have a good amount of room in the overhead lockers. Best seat would be in row 3 in this cabin. Chicken Tikka masala with lemon rice and dahi elaichi rajma (red kidney beans simmered in green cardamom yoghurt). – a signature Chef Maneet Chauhan item. The tuna salad was excellent, and the Chicken Tikka masala tasty and not too spicy. I didn’t have pudding, reclined my seat, and went to sleep for about four hours. This seat is very comfortable for sleeping. There is a lot of room both in terms of width, where the angled nature of the layout gives you lots of room around the shoulders, and also length — see the seat statistics at the end of this piece. I found the cushioning comfortable, not too hard and with only the slightest ridge where the various cushions meet. That said, the noise from the galley was intrusive, and I’m not a light sleeper. When I woke the seatbelt sign was on and remained on for nearly two hours. There were periods of light turbulence during this time, so I understand the safety issue, but the problem is that after a while passengers have to ignore it to use the washrooms, and unless it is during one of those periods of turbulence, the flight attendants ignore those passengers ignoring the light. I asked for a cup of tea and then worked using the in-seat power on my laptop until breakfast was served. Once again I was tempted by the inflight wifi offered by T Mobile, since this was a work day and morning in the UK. But it was good to be able to work without being interrupted by emails so I went through the registration process to check it was glitch free (it was) but then carried on working. Continental breakfast – steel-cut oatmeal with dried fruit and brown sugar. Once again the flight attendants came round early to collect the BOSE headphones, although this time probably only 30 minutes before landing. We then had an uninterrupted descent into Heathrow and were at the gate slightly early. It is a very long walk to immigration from the gate, so make sure your bag has wheels. The seat is very comfortable, but I do wonder about the IFE system on these aircraft, since on the experience of three flights in three days two on the B777-300ER and one on the A321T, the systems are not robust. Food and drink was good on this flight, and the service was generally decent and friendly after the initial hiccups.